Not only is Lynn, Massachusetts the ninth largest municipality in the state, but it is Essex County’s largest city. Sitting roughly nine miles north of Boston on the beautiful Atlantic Coast, Lynn is a commercial and urban manufacturing center and an integral part of Greater Boston’s urban inner core. 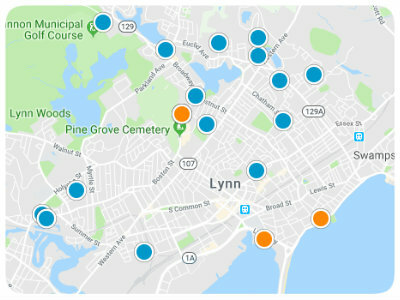 With a diverse population, historic architecture, picturesque parks and open spaces, and its cultured downtown, Lynn is a fabulous place to buy a home. Points of interest include High Rock Tower Reservation, oceanfront Lynn Shore Reservation, Lynn Heritage State Park, the 2,200-acre Lynn Woods Reservation, and the Diamond Historic District. In addition to these, Lynn is home to Manning Field, which has been an important part of the regions’ sporting history for more than seventy years. Manning initially opened in 1938 as Manning Bowl, and throughout the decades it has hosted a plethora of events including fairs, concerts, high school, and professional sports. The Bowl even hosted President John F. Kennedy’s and President Franklin Roosevelt’s memorials. The legendary Harry Agganis and Mark Bavaro played at the venue, as did Ray Charles, the Rolling Stones, and Aerosmith. The Bowl no longer exists but was replaced by Manning Field, a state-of-the-art stadium. Located in the 01904 zip code at 28 Ford Street, the reconstructed stadium offers multiple sports fields, a track open to the public, and convenient parking, all within the Agganis Sports Complex. Adjoining the Sports Complex is Fraser Field which was built in 1940. As part of President Roosevelt’s New Deal, the field has a very long, intriguing history. The Field was formerly home to Lynn Tigers, Lynn Pirates, North Shore Spirit, Lynn Sailors, and the Massachusetts Mad Dogs. Currently, Fraser Field is home to the New England Futures League North Shore Navigators who have been playing here since 2008, winning the championship of the New England College Baseball League in 2010. Additionally, Fraser Field is home to the Fisher College Falcons of Boston and five of Lynn High School’s varsity baseball teams. While the natural grass grows in the outfield, the historic infield is turf. If you are a prospective homebuyer looking for homes for sale in Lynn, Massachusetts, and you are a sports fan, you must plan a visit to the Manning and Fraser Fields.